Back home! I can animate! 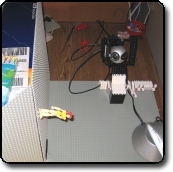 I had the itch to animate so much that I went and did a brickfilm fight tutorial for the brickfilms wiki. Anyways, I started tackling the problem of getting the plates to revolve into place. Stupid Plates, what possessed me to do it this way? The first plate wasn't too bad. I put the whole scene on it's side and then just leaned the rotating plate on the desk and moved it in. It was hard to get it lined up because the plates are really flexible, so it's off in places. But it worked. Then I did a quick shot of Maggie being surprised by the plate. However, the next shot required two plates coming up. Stupid plates, I should get a computer to do this or something. The shot goes by pretty fast and it has too else you would see all the mistakes. I had to do it one at a time and then photoshop all the frames together. I couldn't do it as I did the previous plate, because there was no way I could hold up two plates or put two plates on the side as I did. So I laid out all four plates on the table and took a shot. This was to get them properly lit. Then I removed two and took a shot. This not lit at all; I needed the darkness for background. Then I did one plate coming in, and then I did another. Then, at about 1:00am, I edited each frame so that it looks like they're all one. You can probably look at each frame and laugh how poor it looks. I'm hoping the sound will cover it up.